Global lake evaporation will increase 16 percent by the end of the century as a consequence of climate change, a new Yale study finds. But the specific mechanisms that will drive that phenomenon are not quite what scientists expected. While it is commonly believed that lake evaporation is controlled primarily by incoming solar radiation, the researchers used modeling tools to show that other factors—from shorter ice periods to a "reallocation" of heat energy at lake surfaces—are accelerating the loss of lake water into the atmosphere. In practical terms this accelerated rate of evaporation over the coming decades will, among other outcomes, trigger stronger precipitation events, researchers say. According to these findings, published in the journal Nature Geoscience, understanding these complex dynamics will be critical if scientists are to accurately predict the future hydrological response to climate change. "Typically we focus on the 'top-down' ways that the upper part of the atmosphere triggers feedbacks that enhance warming," said Xuhui Lee, a professor of meteorology at the Yale School of Forestry & Environmental Studies and senior author of the paper. "But if we want to make accurate predictions of the hydrological changes we'll need to understand what's happening at the bottom of the atmosphere, including what's happening at the surface of lakes. 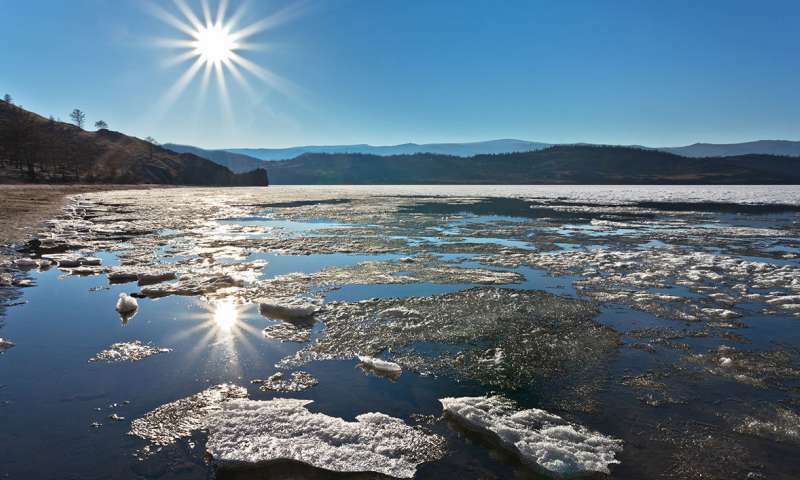 Because those changes are driving the hydrological response to climate change." According to Lee, the same mechanism applies to ocean evaporation, the main source of water for supporting global evaporation. The lead author of the paper is Wei Wang of the Yale-NUIST Center on Atmospheric Environment, which is jointly funded by Yale University and Nanjing University of Information Science and Technology. Warming temperatures will also introduce an increase in energy needed to support the process of evaporation—essentially changing how energy is allocated. The adjustment of lake surface temperature to these changes in energy allocation reflects a feedback effect that can further enhance evaporation. At low altitudes lakes will warm more slowly than the air as climate warms, leading to lower degree of radiation loss that, in turn, allows more energy available for evaporation. On the other hand, at high altitudes lakes will warm faster than air, which result in higher surface radiation loss. Using a lake simulator model to evaluate lake-atmosphere interactions for all major lakes in the world, from 2005 to 2100, the researchers found that about half of the changes in evaporation were attributable to changes in surface energy allocations and shortened ice periods. Another critical factor at regional levels is changes in snowmelt. In cold and polar regions, for instance, reduced snowmelt is the second largest contributor to lake evaporation increases. These hydrological responses to climate change will have profound impacts in regions with many lakes, creating stronger precipitation events as more water evaporates into the atmosphere (what goes up, after all, must come down). For drier regions these shifts could also present challenges in freshwater resource management, Lee said. To make long-term management decisions, for instance, one must understand how much water will stay in a lake; if that predictability is diminished it can make it more difficult to plan for drinking water and agricultural demands. "In dry climates, the increased rate of evaporation may be even higher," he said. "So in some local regions the question of how you conserve water could become an increasingly important question." will this happen after the upcoming glaciation? Will this be before or after the sinking of the Maldives? The researchers are from Yale and they used modeling tools to show... There you have it from an unimpeachable authority. Global PATHOLOGICAL BS will increase 16 percent by the end of the year from the AGW Cult and their Pathological "Science". It was hotter during the 1930s. You guys can rage alll you want at published science but who really cares? You have no argument and no credibility. Yes, higher rainfall often results in lower lakes..."Extreme" is one of the most overused trigger words in the global warming kook vocabulary. More evaporation results in more clouds, which results in more cooling. What's the issue?